Just the other day, I had kept some chicken breast pieces out to thaw and was mulling over what to do with them. I wanted to make something different, something I'd never had before. I started digging around in our trusty blog world, and right enough, I wasn't disappointed. I stumbled upon Barbara's version of Chicken Empanadas. You should check her blog out. She has some wonderful recipes and gorgeous pictures. These can be served up as a snack or coupled with some lovely salad to make a meal in itself. The empanadas are really easy to make and are so delicious. Unfortunately, they are fairly hearty, you won't be able to eat too much. When I made these, they turned out fairly big. I managed to get 9 pieces using the recipe at the end of the post. The only thing I would do differently the next time around, is I'll make them a little smaller in size. Oh yeah, also, I will put cheese in the filling. The original recipe calls for it, but I forgot. Can you believe that? Who forgets to put cheese? Me, that's who. The filling is tasty enough without it. So those of you who are off dairy products, can leave it out. I'm pretty sure that adding cheese will take this lovely empanada to a whole new level. You see what I mean about how big they turned out. I'm definitely making them smaller next time around. Barbara served these up with Ranchero Ranch Dressing. I wanted the dipping sauce to be a little hotter. So I served these up with a spicy tomato sauce, a tomato chilly sauce, to be precise. In a bowl, combine the flour, baking powder and the salt. Rub the butter in till the texture resembles wet sand. Add just enough water to bind it till the dough just starts coming together. Turn it out on a lightly floured surface and knead a little till it forms a smooth, soft batter. Divide into portions, cover the dough balls with cling film and leave to rise for about 20 minutes. In the meanwhile you can make the filling. Saute the onions till they soften. Add the red chilly powder and stir for a while till it is well mixed. After about a minute add the tomatoes and let them cook off till they are soft. Tip in the chicken, salt and black pepper and stir fry well, till the chicken is cooked. You can add a splash of water or chicken stock, if needed. If you do, cook it off till all the liquid is absorbed. Once this is cooked, stir in some grated cheese. Set aside and let it cool off completely. Roll out the balls of dough thinly, one at a time. Place a spoonful of mixture in the center and fold the dough over. Seal the edges by pressing them firmly together. You can trim off the edges if you'd like to and crimp the edges using the prongs of a fork. Place them on parchment lined baking sheets. Brush the tops with the egg wash, staying clear of the edges. Bake for about 25-30 minutes, until golden brown, rotating the trays halfway through the baking time. I know, but I would definitely make them smaller, they would look daintier that way! 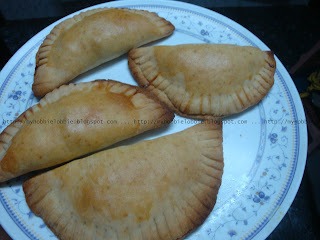 We just love Empanada's and your recipe looks delicious. We will really enjoy trying it. Thank you so much for sharing with Full Plate Thursday and I look forward to seeing you again real soon. Hope you have a great week end! This sounds great, and easy to do! It's a little like what we call curry puffs, from where I come from, perhaps not so spicy. I think I might sneak in a small wedge of hard boiled egg in each, if I make them, to up the oomph factor! PaisleyPink, a wedge of a hard boiled egg sounds great, I'll probably try that the next time! I've always wanted to try to make these. Thanks for sharing at What's Cooking Thursdays! Thanks for stopping by Keli!